There have been a lot of movies about the making of movies. It has become more and more popular for Hollywood to look at itself. Just last year, one of these films, Argo, won Best Picture at the Oscars. This latest film in that genre had a little different take on it all. Few people would argue with the concept that there is Hollywood film making, and then there is Disney. Disney has really created an entire world of its own that puts it in its own category. 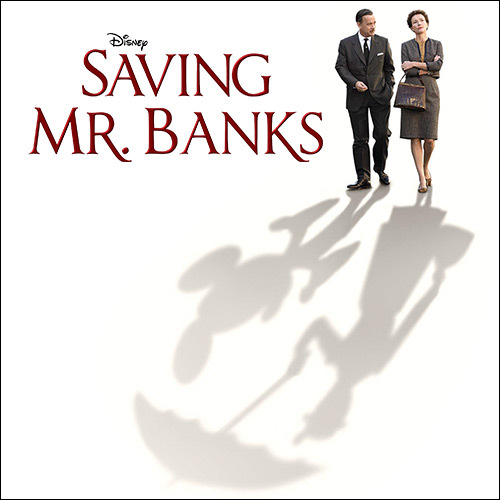 This is the world that is explored in Saving Mr. Banks as it explores the courtship Walt Disney went through to obtain the rights to make the film adaptation of Mary Poppins. Everything Disney has a certain amount of magic and imagination involved. This movie is no different. The film focuses on Mrs. P.L. Travers (played by Emma Thompson), the author of the Mary Poppins book. She is a cranky, cynical, old English woman that is obviously against everything American, and especially Disney. I couldn't help but ask myself several times throughout the film how this woman could be the author of such an imaginative and fun character and story. These questions are answered as the film goes along, and Travers travels to Hollywood to hear Walt Disney's (Tom Hanks) sales pitch that he has been wanting to give for 20 years. While Mrs. Travers works with the screenwriter (Bradley Whitford) and songwriters (Jason Schwartzman, B.J. Novak), images from her past seem to resurface. 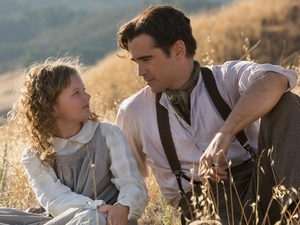 This leads to a parallel storyline of Travers as a young girl growing up with her alcoholic father (Colin Farrell) who also is the one that taught her how to dream and use her imagination. It soon becomes clear that to Mrs. Travers, this story is about more than a flying nanny, but also that little girl so many years ago. There are so many things that make this film remarkable. First, the ensemble of actors that have been put together to bring this story to life is about as good as you can get. 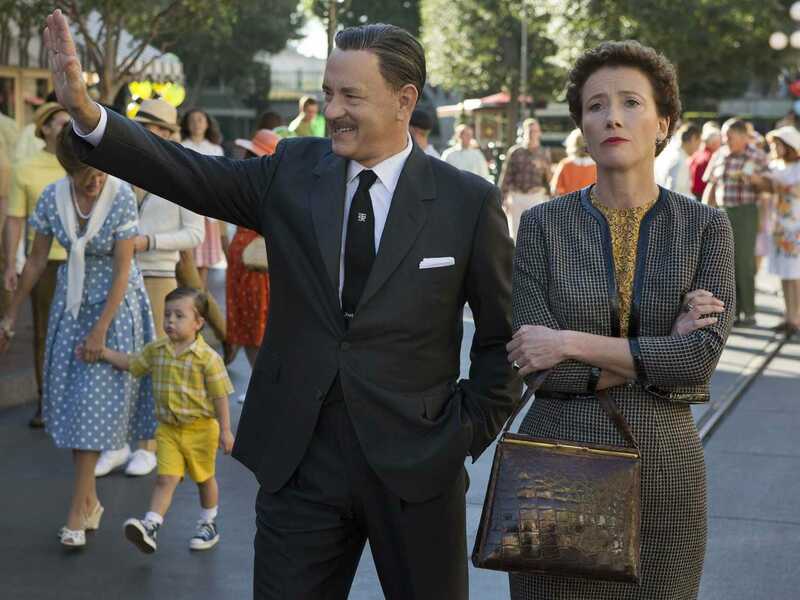 The two leads, Emma Thompson and Tom Hanks, are the only people I could see playing their roles. This is especially true for Hanks as he brings one of the most beloved personalities in Hollywood history to life. Thompson is looking at getting an Oscar nomination for her role, which is completely deserved as she proves to be one of the best out there. The supporting cast of Farrell (who gives one of his all-time best performances), Whitford, Schwartzman, Novak, and (my favorite) Paul Giamatti all seem to be perfectly cast in their roles as well. Director John Lee Hancock, who before this is known most for feel good corny sports films like The Rookie and The Blind Side, shows that all he needed to make his feel good stories become special is a little Mickey Mouse. Two Oscar winners fronting his film help too. What really made this special though was watching this classic story slowly develop and morph into what we all know and love. As Mrs. Travers said, Mary Poppins would not be turned into one of Disney's side show cartoons, which is not too far from what the writers originally intended for the film. However, as your heart breaks for the little girl watching her role model father throw his life away, you begin to understand why the author is so particular about this character and who she is there to save. As she says, Mary Poppins is family. Disney simply wanted to make her part of everyone else's family as well. At the end of this film, only one word came to mind to describe it: magical. How else would you describe a film showing how Disney works? It is one of the most fulfilling and complete moviegoing experiences I have had. I laughed, I cried, I was inspired. Watching how much this story means to its author makes the payoff at the end so much sweeter. It is everything Hancock has wanted to get out of all his other films, but fell short. Again, all he needed was the magic and imagination of Walt Disney. For the last month, everything that has been happening on Saturday Night Live has been leading up to this episode. Ever since they announced that this combination of host and musical guest would be its last episode before the Holiday Break, every new episode was more anticipated because it meant we were one week closer to what could only be described as a dream lineup. With as high as the expectations were, it was bound to disappoint, right? Fortunately, it did not. This might be one of those episodes where you just skip all the little clips I put in here and just skip to the end when you can watch the whole show. One of the things that made the idea of this episode so awesome was the fact that the musical guest is a member of the "5-Timers Club" and possibly the most popular host of the last 10 years. With the great relationship between Fallon and Timberlake (see the Late Night Show and classic SNL sketches), you basically had a co-hosting gig set up with a well-loved host and a well-loved former cast member. Everyone hoped this would be what would happen, and it was confirmed with the opening sketch being one of Timberlake's classics that Jimmy joined him for. A perfect start to what was set up to be the best episode since Timberlake's last appearance. "Bring It On Down to Wrappin-ville!" One of the things that made Jimmy Fallon such a popular cast member back in the day was his endless impressions. He shows them off in the monologue as he sets up to sing some Christmas classics with music icons David Bowie, Bob Dylan, and Sir Paul McCartney. However, they are stuck in traffic which leaves him to sing all the parts by himself until one of them shows up for a special guest appearance. Weekend Update used one of their guests to make one of their few political statements of the night by bringing out Billie Jean King, played by Kate McKinnon (who else). King was recently named to the US delegation to the Winter Olympics in Sochi, Russia next year. The controversy is King is openly gay going to a nation that has basically made it illegal to be gay. McKinnon turned Billie Jean King into a grand instigator that tells Russia and Valdimir Putin to "Bring it!" The second guest spot was, as predicted, Jimmy Fallon to pass the torch onto Seth Meyers who will be taking over Late Night after Fallon moves up to The Tonight Show. Along with Fallon was New York mayor Michael Bloomberg as each of them talked about leaving their current jobs in the next month. Apparently, Bloomberg is really excited to enjoy his small soda on the beach. One small tidbit we picked up out of this bit is a little insight into the eventual departure of Seth Meyers from the Weekend Update desk. Many people thought this would be his last show, however it was stated that he has a few shows left before he leaves Cecily at the desk by herself. I predict Bill Hader's first post-SNL appearance will come on Seth's last show as Stefon needs to send Seth off right. I will say that Cecily has proven the Weekend Update desk is going to be left in good hands. It was impossible to pick one sketch that was the best. With Jimmy and Justin taking over the first half of the show together (Timberlake didn't appear in a sketch after his first musical performance), the first handful of sketches were near perfect. I'll mention two of them here. First came Celebrity Family Feud hosted by Kenan's Steve Harvey. It put CBS vs. NBC in the classic game show giving cast members another chance to show off their impressions. For the CBS team, you had Jim Parsons (Jimmy Fallon), Ashton Kutcher (Taran Killam), Jon Cryer (John Milhiser), and Alyson Hannigan (Noel Wells). All of these were spot-on (as long as Ashton Kutcher doesn't have to do anything but yell). I love how SNL loves to make fun of the network that writes their checks. They do that again here in a couple ways. First, the contestants are Jimmy Fallon by way of Justin Timberlake (yeah, that happens), Kate McKinnon's Jane Lynch (who apparently now hosts a game show on NBC no one watches), Jay Pharaoh showing once again he can impersonate any black man in pop culture with Ice-T, and Brooks Wheelan ... playing Brooks Wheelan. It was a good joke having a little used featured player represent SNL in the NBC lineup. It also showed that NBC doesn't have enough stars to have another regular impression. The NBC dagger came when it was announced that the charity the NBC team would be playing for is NBC itself. Although all this was funny, the magic comes when Timberlake goes face-to-face with the man he is impersonating (who, by the way, is well known as the worst SNL cast member at keeping a straight face in the history of the show). At one point, Jimmy had to hide behind his podium because he was laughing too hard to control it. The other sketch tied with Family Feud brings back an old classic from when Fallon was a cast member and Timberlake was hosting for the first time. It's the Barry Gibb Talk Show starring the brothers that started the Bee-Gees, Barry and Robin Gibb, interviewing their political guests. This sketch is so silly that you just have to laugh. It brings one of the great tragedies of the last presidential election back to the forefront, and that is we don't get to see Taran Killam's Paul Ryan on a regular basis. It's so good. We also get to see a couple more Christmas cameos from the one and only Madonna and the real Barry Gibb. My guess is they asked his permission to do the show since Robin Gibb passed away recently, and he wanted to show his support by appearing in the sketch. It worked beautifully. Finding the worst sketch of this episode was actually pretty easy because only one of the sketches from the night fell flat. It was a take on A Christmas Carol as Scrooge is shown a scene from his past that is quite revealing. It is quickly discovered what is being revealed as Jimmy Fallon plays young Scrooge channeling Richard Simmons. Oh I get it, Scrooge is gay. Why was that supposed to be funny? Oh well, this sketch can be forgiven looking at the rest of the show. I couldn't pick again for the Dark Horse so we have another tie. First comes another showcase of impersonations which always seems to be a favorite of mine. Here we have a highlight of Christmas music done by a variety of random artists. My favorites out of here are Noel Wells's Zooey Dechanel (which was actually one of her claims to fame on youtube pre-SNL) and three Jimmy Fallon impressions: One Direction's Harry Styles, Professor Snape played by Alan Rickman, and Pitbull. Oh how I love good impressions! The second Dark Horse Sketch involves the holiday favorite song "Baby It's Cold Outside" sung by Jimmy Fallon and Cecily Strong. They act out and sing through the first verse beautifully. Then it skips ahead to what happens after the girl has been convinced. The roles are now reversed as the man tries to kick her out while the girl just wants to stay and cuddle all day. It was a perfect way to finish Christmas according to Saturday Night Live. If you couldn't tell, I loved this episode. This not only is the best episode of the year so far, but it is one of the best I have seen. It really can't get much better than this. There were only a few sketches I didn't mention already, one of which was a music video about how awkward it can be to take your significant other home for the holidays. However, this sketch would have won the best sketch award in any of the last three or four episodes. The quality was just so high from start to finish. It really seemed to be true that the writers mailed it in the last couple weeks to make sure this episode was as great as it could possibly be. It had the potential to be an instant classic, and it definitely proved that it was. Leg two of the three-episode series of Christmas episodes heading into the holidays featured an old favorite. John Goodman hadn't hosted in awhile, but this was his 13th time hosting the show, making him one of the most loved hosts of all time. Like the week before, we all knew this had the potential of being a special show with some guest appearances. Although John Goodman once again shows that he could have been a cast member and will always give a great show, the episode fell short of iconic. The cold opening started off the show with President Obama for only the second time this year. With everything that has been going on with the President, it was about time SNL gave their commentary on it. However, stealing the show was Kenan playing the fake interpreter for the hearing impaired that popped up at Nelson Mandela's funeral. The geeky, grinning Kenan made everything Pharaoh's Obama was saying even funnier. It takes a beloved host for them to give a completely random song to them and ask him to go out there and kill it. That's what they did with John Goodman, and he did. What does he really want for Christmas? You will just have to listen to find out in this song that could have been the opportunity to do a Blues Brothers number. Instead, Kenan fills in admirably. By the way, John Goodman is a huge man. You don't quite understand how big until he stands next to Kenan and makes him look short and skinny. In what seems to be the Seth Meyers farewell tour, all the favorite Weekend Update characters (that are left) have been coming by to pay their respects. This week it was Drunk Uncle with John Goodman playing Drunk Uncle's Drunk Uncle. It was so perfect of a union of character and character actor (much better than any of the others they have tried to guest star with Moynihan). Once again, Goodman makes a big guy look tiny. That dude is a giant! The other guest was a response to the now infamous Megyn Kelly comment that Santa has to be white. Enter the Black Santa trying to break as stereotypes as he can. It served its purpose of making a statement on the topic. Outside of the greatness of the sketches already mentioned, there wasn't a lot that jumped off the screen. Probably the best of the rest was the tour de force of impressions that came out of Guy Fieri's Christmas Bash. Bobby Moynihan does a scary Fieri as the host of what he describes as "a party as random as the food he makes." Here are a couple things we can take from this sketch: Aidy Bryant looks scarily like Mimi from the Drew Carey Show, anyone can look like Mini Me with a bald cap and a pinky, and Bobby Moynihan can simultaneously look like every member of the cast of Pawn Stars. Honorable mention goes to the Dance of the Snowflake. Something just makes me happy inside to see John Goodman wear a giant snowflake outfit. Like I said, not much jumped off the screen, however not much missed either. The closest thing to a miss was this Will Smith-esque impression and rap about H&M. It just wasn't my thing. Honorable mention would have to be the shameless plug for the new holiday flop Grudge Match with Sylvester Stallone and Robert DeNiro. The two stars show up and form the Three Wise Guys with Goodman. There were some pretty funny one-liners which kept it from being too painful. For some reason, and I don't know why, but when John Goodman is hosting, you expect to see him in drag at some point. It just makes too much comedic sense to put a man of his size in a wig and a skirt. This comedic gold comes out here as Goodman plays a woman suing her former employer for wrongful termination. She claims she was fired for being too beautiful. Let me repeat that. John Goodman dressed as a woman was fired for being too beautiful. I agree with Taran Killam's opening statement representing the company: "Really?!?" As I said, this episode definitely was a disappointment from what it could be. John Goodman is such an iconic host that it could have been something magical. However, it was almost as if the writers were so focused on the final episode to come that they went into cruise control for the couple leading up to it. With that said, John Goodman is hilarious. He is so likable and lovable that it was hard to hate anything he did here. It was a good episode, but much like the Paul Rudd episode the week before, it could have been so much more. It's that most wonderful time of the year. Yes, Christmas is next week, but that's not what I'm talking about. Bowl season starts today with the first of 35 bowl games to be played over the next 3+ weeks all culminating in the National Championship game between Florida St. and Auburn. This will be the last National Championship game determined by the beloved BCS which tried to bring some objectivity into the system of determining a National Champion. It will be replaced next year by the very cleverly named "College Football Playoff" (as if there aren't already 4 others in other divisions) and be determined exclusively through subjectivity with a selection committee in charge of finding the 4 best teams in the nation. Two bowl games will be used as the semifinals with a National Championship game being played the week after in a neutral site determined much like the Super Bowl sites. This is definitely a step in the right direction, but it certainly doesn't solve the problem. There are still some very gaping holes in the system that could be easily fixed by an exciting format that would rival March Madness. For the past few years, I have been calling it Holiday Madness. There are several problems with the future College Football Playoff. First, it brings subjectivity back into the equation. The beauty of the BCS was a computer formula using several groups of people's opinions to determine an overall rank. Many people hated the BCS, but I thought it was a good attempt at what was really needed in college football: objectivity. I know the selection committee is from all over the country and will do their best, but when one group of people is in charge and makes all the decisions, biases and favorites are bound to play a factor. The second problem with this system is one of the problems with bowl season. Your top teams get a month off before having to compete in their playoff. So many times in the past, you have a team riding a crazy run of momentum going into bowl season, and they come out flat and get slaughtered in their bowl game because they have too much time off. If you want a true test of which team is the best, you can't take a month off after the season. A third problem I see with the system, which might be the biggest problem, is a four team playoff isn't going to fix anything. Yes, it is a step in the right direction, but how can you pick just four teams that are worthy. Look at this year's top teams. If this were next year, who would be in the playoff? Obviously, Florida St. and Auburn would be the top two seeds. Then who? Alabama? They didn't even make their conference championship game which Duck fans will never let this Husker fan forget hasn't had a history of working out too well. What about Michigan St.? They ended up in 4th in the BCS with one loss and a big win against Ohio St. to win the Big 10 Championship. However, the Big 10 has been universally blasted this year as an inferior conference to the point that a majority of the country wanted to see a one-loss SEC team in the National Championship over an undefeated Ohio St. if the Buckeyes could have finished their 2-year run without a loss. Who's next? Stanford? They came out on top of what might have been the best and deepest conference (don't tell anyone in the SEC I said that) this year, but they also had two head-scratching losses in conference. How about Baylor? They had one bad night against Oklahoma St. on the road with many key players out hurt. Outside of that night, they were the most dominant offense in the country in a conference that didn't get near the respect it deserved this year. And what about Ohio St.? They ended the year with a loss, but had a magical run going before that. Should they be rewarded for it? With so much of every school's season being in conference, and teams being vastly different at the end of the year than they were at the beginning of the year when most non-conference play happens (I mean, Auburn almost lost to Washington St. ... at home), so much of the selection process is going to come down to ranking the strength of conferences which is completely subjective. Some people look at all the SEC teams at the top of the rankings with outstanding records. Others could see it as a sign that the bottom of that conference is very weak. The SEC and Big 10 both ended the season with its top two teams in the top 10 of the BCS with one loss each. Popular opinion says this shows the strength of the SEC that no one could go undefeated through that tough schedule while it shows the weakness of the Big 10 because no one could go undefeated through that weak conference. It all comes down to opinion of conference strength. Most likely, if the College Football Playoff were to take place this year, the four teams would be Florida St., Auburn, Alabama, and Stanford for these very reasons. Only three conferences would be represented after a dozen years of the BCS that put six conferences on an equal playing field. I say, if you can go through a conference schedule, ANY conference schedule, and come out on the top of the conference, you deserve a shot at competing for a title. Many people say in time, the College Football Playoff will probably expand from 4 to 8 teams, but I don't think that enough. Enter Holiday Madness. Holiday Madness would involve 16 teams and would include the conference champions of every FBS conference. Like I said, any team that is able to win their conference at their level of competition should get an opportunity to play for a title that's more than New Orleans Bowl champion. Like I said, if we were to have the College Football Playoff this year the battle-tested one-loss conference champs of two top conferences (Big 10 & Big 12) would be left out of the party. They deserve their shot. They use this rationale with college basketball's March Madness. Why couldn't they borrow from that and make a great playoff here that could be just as unpredictable? Also, there would no longer need to be an argument over which conference was better. They would play it out to find out. It wouldn't mean bowls would have to go away. Sixteen teams would be involved in the playoff. This year, there are 70 teams in bowl games. The bowl games will mean just as much as they do now (which is ... nothing). Holiday Madness would run the duration of the current bowl season so it wouldn't make the season any longer. This means we could be talking about the first round of the playoffs right now instead of Washington St. vs. Colorado St. Also, it would mean teams would only have a one or two week break after the end of the season before the playoff would start. This would still allow for awards ceremonies and finals week. (They are still STUDENT-athletes after all.) There are ten conferences that would have automatic bids which leaves room for six at-large teams to make the playoffs (determined here by the top 6 non-conference winners in the BCS). This would also most likely slow or stop the crazy conference realignment that has been taking place over the last few years. If every conference gets an opportunity to play for a national championship, there is no need to change to a more respected conference to have a better shot at playing meaningful games. It makes perfect sense to me. Here is how the bracket would look this year and how I think it would play out. Clemson - Some argue that having a bracket this big makes the regular season less important and watered down. If I remember correct, they said the same thing when MLB added wild cards to their postseason. However, what has proven true in MLB and would be proven true here as well is it simply makes it more meaningful because more teams have meaningful games down the stretch. No teams this year outside of the top 4 or 5 teams played in meaningful games in the last few weeks this year. However, with a 16 team playoff, all of a sudden Clemson's matchup in the last week against South Carolina becomes a battle for a playoff spot. Clemson came out flat because win or lose, they ended up in the same place in the bowl season. This game could have actually had something significant riding on it. Oklahoma St. - The Cowboys went from having an outside shot at a National Championship birth to even being out of the top 16 playoff with their last second loss to Oklahoma. With as much that was already riding on this game, it could have been even more significant. Arizona St. - The surprise team to come out of the Pac-12 South this year could have greatly upset a bracket like this with a win over Stanford in the Pac-12 Championship game. They could have been the first bracket buster in college football. Instead, they are left on the outside looking in. Northern Illinois - Everyone in the media took a collective sigh of relief when the NIU Fighting Lynches took a dive in the MAC Championship Game to ruin their undefeated season and their shot at a BCS game. I didn't. I wanted to see the most dominant college football player of the last two years have a shot again at the top competition in the nation. With a good performance in the bowl game, Jordan Lynch could end up with a 2000 passing / 2000 rushing season! How insane is that?!? Not only did that loss knock them out of the BCS, but they lost their shot at playing for a National Championship in the Holiday Madness too. Now for the matchups!!! The losers of the first round could even be assigned after to New Year's Day bowl games. They are obviously the number one team as the only undefeated team left in FBS. In the first two rounds, the top ranked team hosts the playoff games which means this would take place in Tallahassee with newly-crowned Heisman Trophy freshman Jameis Winston. The Sun Belt is pretty obviously the weakest conference in FBS, however we would get a chance to see that as the Ragin' Cajuns get rewarded for winning their conference. In March Madness, no 16-seed has ever beaten a 1-seed. They come close every now and then though. Would that happen here? Probably not. If anything shows that the SEC isn't as strong as everyone makes it out to be, it is the success of Mizzou this year. They went from being an average Big 12 team to playing for an SEC Championship in 2 years. Combine that with what Texas A&M was able to do last year, and one has to question what all the media says about the SEC. With that said, Missouri is about as battle tested of a team as you could find in the country. They went through a month where they had to start their true Freshman backup QB and almost went undefeated. Now Missouri shows how the SEC Championship Game wouldn't mean as much under this system as it did this year. It was basically a play-in game for the National Championship. However, I'm sure everyone would rather play the 15-seed instead of the 9-seed in this bracket. Plus, so many other games become play-in games that it would be a worthy sacrifice. If there is such a thing in college football as a quiet 2-loss season, it was the Gamecocks this season. They lost to Georgia pre-injuries, but then lost to Tennessee who only won two conference games all year. They barely beat UCF, Kentucky, and Florida, but beat Clemson and gave Missouri its one blemish before the SEC Championship game. This was an epic matchup during the season that came down to Missouri clanking a 20-yard field goal off the upright in overtime to end the game. Now this was during James Franklin's injury so that would be a factor in the rematch. I think Missouri would come out mad with something to prove. However, the Gamecocks seem to be in every game. Everyone all season doubted what Sparty was capable of this season. Then they ended up with just one loss to Notre Dame and a huge win against the Buckeyes in the Big 10 Championship Game. They are the epitome of smash-mouth football. On a side note, one of the most interesting bowl matchups this year is Stanford-Michigan St. in the Rose Bowl. They both play old-school physical football. It should be fun to watch which one wins out. If it wasn't for a late season loss in an insane shootout to San Jose St., we would be talking about the Bulldogs in a BCS game right now. Instead, they have to settle for a conference title and a birth in the Holiday Madness bracket. Derek Carr has been one of the best and most efficient quarterbacks in the country this season. Could Derek Carr survive the crazy defense Sparty run out there? Michigan St. was able to shut down Braxton Miller and Ohio St. I think they would still have something to prove as they try and show the Big 10 is better than everyone thinks. This is a great David vs. Goliath matchup. When they play their game, no one can stop them. The problem is they had two moments this year when they just came out flat. Kevin Hogan has the potential of being another Andrew Luck in a couple years being one of those "can't miss" prospects. This is one of the most complete teams out there. It is remarkable how little people have been talking about the Scarlet Knights of Central Florida. Their one loss this season was a late-game collapse against South Carolina, they ruined Teddy Bridgewater's run at an undefeated season, and they had some pretty miraculous comebacks and finishes of their own. Many people are saying their QB, Blake Bortles, has a chance at being a top 10 pick in this year's draft. This is not a team that can be overlooked. The 5-12 matchup is always where there is some excitement in the March Madness bracket. I think this game will be surprising in how close it is, but I don't think there will be an upset. Stanford is just too good, especially at home. The Tigers might be the luckiest team in the nation. They can barely beat Wazzu and Mississippi St. at the beginning of the season, squeak by Texas A&M, have unbelievable miracles happen in the closing seconds to beat Georgia and Alabama, and now they are regarded as a team of destiny. When things are going that well for you, it's either you are a team of destiny or your luck is about to run out. You wouldn't think Rice would have much of a shot in a game like this, but the Owls are better than you may think. They gave the Aggies fits at the start of the year in Johnny Manziel's suspension game, and they capped off the year beating Marshall, one of the hottest teams in the nation. They have quietly had a solid program over the last couple years and can't be taken lightly. Auburn's offense under Gus Malzahn has become unstoppable this last month. Tre Mason ran for over 300 yards on a very good Missouri defense in the SEC Championship. Rice might put up a fight at first, but this offense isn't rolling over against the Owls. Here is another example of a game not meaning as much. If the Buckeyes win in the Big 10 Championship game, they are a top 2 team. They lost so they are out of the Championship where here they still have a shot. (Ohio St. wins that game and Michigan St. is eliminated though, so it could be a wash.) However, I think they would rather be playing Rice in the first round than Oregon. Here is another example of how more games have meaning with a 16 team bracket. Oregon was one of the top teams in the nation all year until they couldn't get past Stanford again. They then had a let-down game against Arizona (something that wouldn't have happened under Chip Kelly, by the way). However, it all came down to the Civil War against Oregon St. If Marcus Mariota doesn't drive down the field and get a last second TD to win that game, they don't make this playoff. Under the current system, no one cared outside of Oregon. On a side note, it is a joke that Oregon is out of the BCS in favor of Oklahoma. Like I said before, the PAC-12 could be the best conference in the nation this year, and they only get one BCS bid for its conference champion. Why? Because the Sooners will draw more fans to New Orleans than the Ducks will. This once again shows that no one running things actually cares about the product on the field, but only about how much money they can make. What an intriguing matchup! This could have easily been the National Championship game this year. Oregon has struggled against physical teams, but Ohio St. also looks like a clone of the Ducks in many ways. Urban Meyer is definitely the better coach. Mariota is the better quarterback. The game being in Columbus will be a factor too. It will be one of those games where is comes down to who has the ball last. I think the Iron Bowl was the only possible game the Crimson Tide could lose. They are such a complete, well coached team that the only way they were going to go down was in an unpredictable rivalry game. With that said, no one would want to play them in this bracket, especially in Tuscaloosa. You don't think much of Bowling Green just by hearing the name, but they are the only non-BCS school to take down Jordan Lynch's Northern Illinois team over the last two seasons (Iowa and Florida St. were their other losses). They showed that when they are on top of their game, they can be dangerous. Roll Tide. The last time they were on a football field they were watching Auburn run away with their dreams. A second chance would not be taken lightly, and they would use Bowling Green as an example. Outside of one bad night in Stillwater, this team has been as untouchable as any team in the nation. Again, the "experts" will say it is because they haven't played anybody, but the Big 12 might be the one of the toughest conferences to run the table in. They play everyone, and Baylor handled their business, including a beat down of the Sooners. Although the Sooners are playing well and will be out for revenge, Baylor is just too good. They want to prove that they belong with the top programs. It won't be the blowout it was the first time, but nothing tells me the final result will be different. #8 Missouri at #1 Florida St. I think the pass rush of Mizzou would give Jameis Winston some issues, but eventually the Seminoles would show that they are the better team overall in what would almost look like an NFL game. #5 Stanford at #4 Michigan St.
We get our dream matchup that is coming up in the Rose Bowl anyways. Stanford would have to travel, but I think they are just a couple steps ahead of where Sparty is. If Michigan St. continues doing what they are doing, they will be where Stanford is at in a couple years, but not yet. This is a low scoring, defensive struggle. Here we have a rematch of one of the best National Championship games in the BCS era (behind only the USC-Texas showdown). Even though it is a 2-10 matchup, this really is a toss-up. I say experience and leadership wins out in this matchup that gives the Ducks an opportunity at some long-awaited vengeance. Like I said, I don't think Bama can be stopped at home. Baylor will give them a look they don't like though (see Auburn). The spread gives the Tide fits. However, Baylor still needs a little more experience to go into Tuscaloosa and win. If I said the Florida St./Missouri game would look like an NFL game, then this would look like the Super Bowl. These two teams are so good and efficient at what they do, I really don't want to choose a winner because it is a coin flip. At some point, the youth and inexperience of Florida St. has to show its ugly head, and I could see it pop up here against a strong team like Stanford. I wish we could see this matchup though. I'm getting excited just thinking about this bracket even though I know it's never going to happen. Man, wouldn't this be fun! All year, Duck fans said, "We want Bama!!!" Now they actually get them. The most dominant team in the west over the last 5 years versus the most dominant team of the east over the last 5 years. Beating Auburn is one thing for the Ducks, but the size and physicality of the Tide is what always gives them trouble (see the last two Stanford matchups). Alabama is on a mission too. I think the dream comeback run for Oregon stops here. Location picked much like College Football Playoff location will be picked. Outside of Florida St., these are the two teams that have looked the most consistently dominant this season. If I had to pick a winner, once again I go with experience. Kevin Hogan will be a great quarterback and is very close to one now, but AJ McCarron has already won two National Championships. He knows what it takes, and will lead his team down the stretch ... as long as it doesn't come down to a field goal. So what do you think? Who do you think would emerge victorious from a bracket like this? I wish we could have the opportunity to find out. Instead we will just have to enjoy what we do have knowing that we are working in the right direction. Coming down the stretch to Christmas at Saturday Night Live, a dream lineup had been assembled to make for a run of shows that would go down as SNL classics. The first of the three, comparatively, was bound to be the worst of the group when you consider John Goodman (one of the greatest hosts of all time) and the Jimmy Fallon / Justin Timberlake explosion were going to follow it up. However, Paul Rudd is no slouch, and once I realized he would be there promoting his upcoming movie that stars possibly the most beloved SNL cast members of the last 20 years, I knew we might be in for something special. I knew we might have an appearance of Ron Burgundy and the Channel 4 News Team because Paul Rudd was hosting. What I did not realize was that the random guest stars that always seem to pop up around the holidays would not just be confined to the one Christmas episode this year. It would be a 3 episode star-studded affair. This became evident right off the bat when SNL made their statement on the live broadcast of The Sound of Music starring Carrie Underwood. Enter Kristen Wiig and Fred Armisen, two former cast members that really could never be replaced. They pull out one of their old classic bits that is endlessly entertaining, and I still have no idea why. Enjoy. It's not that the rest of the show was terrible. It just never reached the perfection that were the first two sketches. Weekend Update brought back two very popular characters, one brand new and one that has been around for a year or so. First was Bar-Mitzvah Boy Jacob who is always fun. It also brought about one of the first blatant references to Seth Meyers's upcoming departure for the new Late Night show as Jimmy Fallon takes over for Leno. (By the way, odds Fallon has a moment of advice at the Weekend Update desk for Seth Meyers in his final episode? I would say high.) The next act, Jebidiah Atkinson, has become an instant classic as he berates and rips apart anything that America holds as beloved. Today's subject of his attack? Christmas stories. Taran Killam can do anything and has quickly become the new Will Ferrell. The rest of the sketches after the first two were solid for the most part, but nowhere near great. The best of these others just happened to also include One Direction as Paul Rudd played their biggest fan, Dan Charles. The best part of this sketch is watching him talk to all the teen and tween girls waiting in the same line he is in. They obviously don't like the fact that he is there. Usually the mock movie trailers are my favorite parts of this season. However, this trailer for White Christmas falls flat. The premise was to take a basic movie trailer for a Tyler Perry movie or any other recent Black comedy and swap out all the cast members for the whitest people you can find. Is it still funny? No, it's not. And maybe that was the joke. Maybe it was purposefully stupid. Either way, the only thing worth seeing here is Paul Rudd dressed as a white Madea. Once you see it though, there is not much else to see, besides the confused looks on Kenan's and Jay's faces. Like I have said before, this spot is reserved for the fun, off-beat, surprising sketch after Weekend Update that stands out for its odd-ball comedy. With Will Ferrell in town, they couldn't resist dusting off the greatest Dark Horse Sketch in recent memory: Bill Brasky. If you haven't seen a Bill Brasky sketch, here it is in a nutshell: Will Ferrell and his cronies dawn bad suits and buck teeth and spout out the most random crap they can think of about their dear friend Bill while drinking from over-sized scotch glasses. It is so stupid and so hysterical all at the same time. I wish we didn't have to wait 10 years to see a new one. This show got off to the best start it could possibly have. Although it fizzled a little in the middle, it ended with another classic and got the holiday season off to a great start. If what I thought before the show is true, and Paul Rudd's turn as hosting would be the jumping-off point for this run of three great episodes leading up to Christmas, then I can't wait to see what kind of genius we have waiting for us in the coming weeks.